Mount Frissell is the highest point in the state of Connecticut. 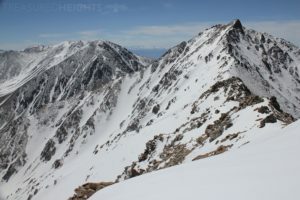 It is part of the 20+ “snowy” state highpoints, so I had to get this small peak when it was in after a storm. Connecticut has good sailing and climbing, you don’t really hear about its backcountry skiing potential, but there is some on good years. 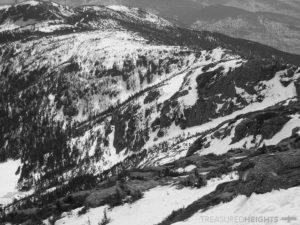 There are no avalanche resources in Conneticut, however the possibility of avalanches exists on open terrain. Even a small open slope on road cuts above cliffs can slide. The state has a few ski areas including Mohawk Mountain, Mount Southington, Ski Sundown, and more. These areas can be a lot of fun if you get a weather system dumping tons of snow off the nearby Atlantic ocean. You’ve got enough vertical (600+’) to have a good time, however be aware that most of the year you will be skiing on firm man-made snow. 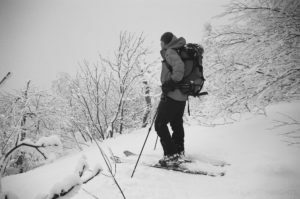 Lack of consistent base to cover up the rough trails of metamorphic rock, vertical drops of less than 500’ on most mountains and dense woods might be a reason why Connecticut does not come up on the radar for backcountry skiing. I’m sure some local kids have skied some heavenly deep pow-covered farm fields and road cuts here from time to time. Great skiers often are born from ‘conflict’ zones like Pennsylvania, Michigan, Nebraska and Connecticut – places with cold winters and some hills, but not enough terrain to make a skier feel fully nourished and lazy. CT has just enough snow to awaken the inner ski-beast, and leave them motivated to pursue more great skiing in other places. When searching for home ski videos of CT backcountry I came up with only 4 on the main search. One of MogulSkier149 skiing some gnarly thick woods in thin conditions, and a few by Jim Moore. Cheers to local skiers exploring their state. Mount Frissell is a whopping 2454’ (779m) high in the Taconic Range which forms the border of New York State and Connecticut. This little range is fun in the summer, it’s got some climbing, Bash Bish Falls, steep rocky ravines and old hemlock forests. I’ve bushwhacked around the range a few times. Muddy 1998 VHS-C video of perhaps the best turns through hardwood forests of the dizzying heights of Mt. Frissell. The Catskills visible in the distance. This was my first state high point of the 24 states. Connecticut just barely counts as a “snowy” state for the skiing the highpoints project. This is evident by the thick scrub oak and mountain laurel which only grows in warmer climates. 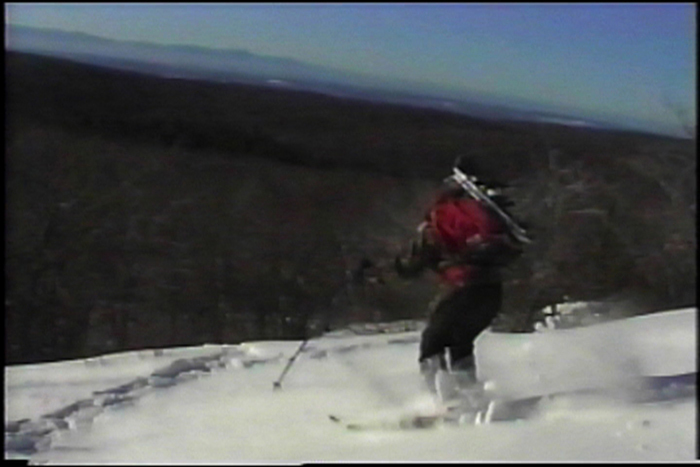 One day in 1998 I found out it dumped 18” in the Catskills area. I know this would grace Frissell with the needed depth, so I jumped on the opportunity to ski the peak with photographer/author John Winkler. He loved snowshoeing new stuff and I also snowshoed up, because I didn’t have backcountry gear. Back then I was drooling over the Silvretta bindings but couldn’t afford them. Having a background in farm work I didn’t mind carrying the extra weight of 8 lb ski boots in my bag and 10 lbs of skis. It was no sweat actually. Just think, I saved myself from having to carry 2 pounds of stupid skins, right? We started from the New York side of the range at the Mount Alander trailhead, going up a trail up a ravine, this lead to a flat ridge which undulated and offered awesome views of the Catskills and the Hudson Valley. The sunny open balds on the ridge are great. I think we did both Brace and South Brace Mountains as well as Frissell. The view from Brace is cool as you are more than 2000’ above the Hudson River to the west. Mountain Laurel vs. Willow vs. Spruce vs. Sagebrush, which do you hate the most? I’ve skied in every snowy corner of the country and it is hard to say which type of plant I hate the most. In the Sierra Nevada the willows and sagebrush are dreadful. In Colorado you have the willows too. In the Adirondacks and Whites of the Northeast you have mini spruce trees so thick you feel like you are swimming and you need your arms to push you forward. Sometimes the spruces suspend your entire body by your arms and your skis and legs are unweighted, as if a giant man just lifted you by your shoulders. In Minnesota there were some kind of thin whippers that slap you in the face, and collectively can drag you down like a thousand hands, and when it did one time I broke my hand when I fell. Connecticut and Pennsylvania mountain laurel just may be the worst plant of all for skiers. You can’t swim in it like with spruces, they won’t hold you up in the air, the plant is weak enough that it just makes you fall in a random direction when you lean into it, twisting your legs and skis. Despite the challenges on Frissell it was a fun ski. While it had no off trail options, the trail wound around like a roller coaster. 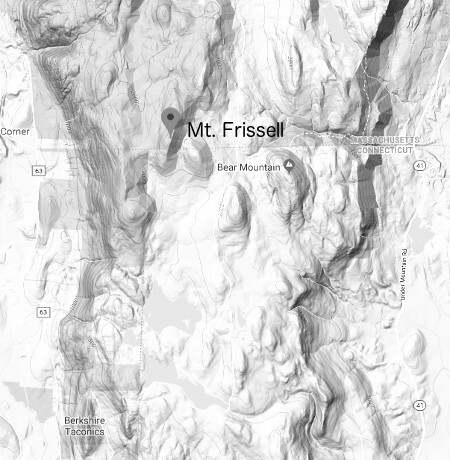 The whole complex of peaks around Frissell-Mt Washingon, MA is a good ski tour. The next time you get a big snow along the Atlantic Coast its worth ski-sploring around areas you may find promising in the state. You will discover many of the stumpy peaks have great views and personality. 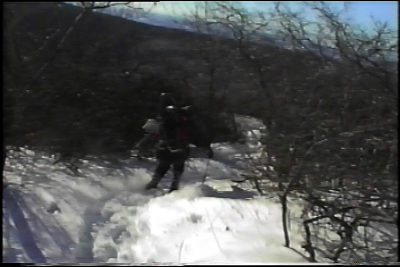 I don’t think we’ll see an episode of “Skiing States” on mount Frissell, The VHS-C video of it quite murky and not going to do justice to the beauty of the Taconic Range. However you can see other states on YouTube this winter as they are released. Skiing a “higher” peak in Connecticut at sunset by MogulSkier149 under thin conditions, making the most of it! Follow Treasured Heights on Facebook or on Instagram. Or subscribe to the YouTube Channel.